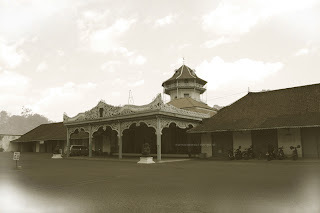 Keraton Kasunanan, Surakarta Hadiningrat, place of PakuBuwono the Sultan of Surakarta. Kasunanan Surakarta Sultanate was a kingdom in Central Java that was built in 1755 as a result of the Giyanti agreement February 13, 1755. Agreement between the VOC with the disputing parties in the Sultanate of Mataram, the Sunan Pakubuwana III and Prince Mangkubumi, agreed that the Sultanate of Mataram is divided into two regions, namely Surakarta and Yogyakarta. The next area of ​​Surakarta Kasunanan diminishing, due March 17, 1757 by the Salatiga Agreement. Raden Mas Said recognized as an independent prince with the power status, called the Praja Mangkunegaran. As a ruler, Raden Mas Said title Duke of Mangkunegara. VOCs do not like Amangkurat III as opposed to, VOC titled Pakubuwana I (Puger) as king. As a result of Mataram have two kings, and this led to internal divisions. Surakarta region is reduced even further after Java War in 1830, where the major areas given to the Dutch as a compensation costs of war. One of the best place to stay in Solo is Ibis Hotel Solo, located in the downtown road. 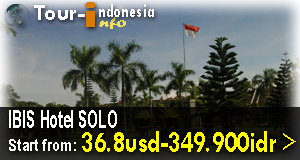 Ibis SOLO, published price IDR 400.000/night, our very discounted price IDR 370.000/night.